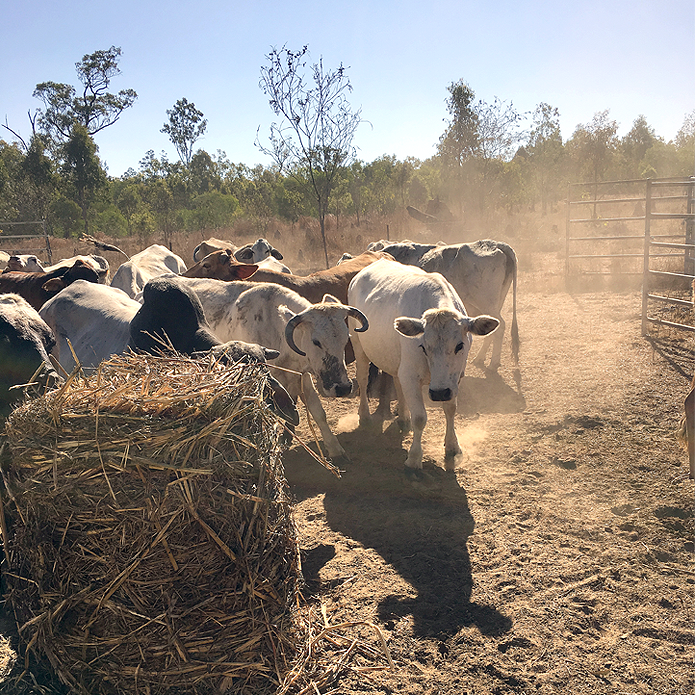 My second WWOOF placement was on a cattle range in Ravenshoe, a small town in the Tablelands region west of Cairns. (The town is pronounced ravens-hoe; you read raven-shoe didn't you?) This was my first experience with cattle and on day one I was thrown into the fire like I knew what I was doing. And it was great! My first day was by far the busiest and longest, but easily the most rewarding of the 2+ weeks I spent there. I had messaged the hosts a few days before I arrived to confirm bus times, and they ended their reply with, "We're scheduled to move some cattle Saturday, so timing is perfect." Uh huh, sounds great, totally know what you mean. My host Phil picked me up from the bus stop Friday evening and we got right to work early Saturday. Phil drove us out to their biggest property, roughly 7,000 acres in the small town of Mt. Garnet. As we drove out to the property I was told we have to ween some of the bigger calves off their mothers in order for them to become self-sufficient and so the mothers can put some weight back on. Great, easy... we'll just grab the little tikes and put them in a playpen or something. When we finally drive up to the holding paddock in the middle of the property, there are 300+ cows roaming around and looking a little irritated. I'm at a complete loss at how I'm supposed to help. When there are big jobs like this, Phil will contract other farmers to come and help out for a few days. Luckily a local bloke, Ian, was already there with two horses and four dogs in tow. One of the first things he said to me was, "You fine taking a horse?" Good lord, these people are trusting with their animals and equipment! Ian had done the big round up the day before. 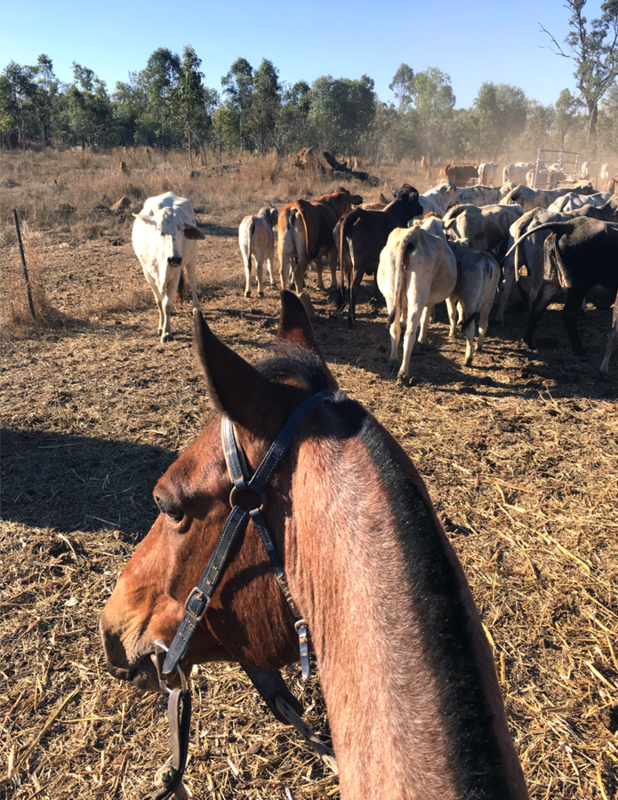 He rode through the property mustering the cows into the paddock. The cows know the paddock means treats of hay and molasses, so when they see Ian riding through the property on his horse they know where to head. So now that they were all rounded up, we had to filter out the thin mothers and load them onto a lorry so they could be moved to another field where there is greener grass and no hungry babies. We used portable steal gates to form a smaller pen in the paddock, with an exit which could be directed to the truck ramp our back out into the property. Now we just need the cows to walk through one by one for selection... single file, no pushing, please. At this point, I am still clueless as to how I'm going to help. I was handed the reigns to a horse and was told he was a softy. There wasn't much else to do but get on and pray for a good outcome. So within an hour of day one, I was on a horse herding cows into a pen! I hadn't been on a horse since I was a child, but ya know, it's just like riding a bike. Ian used a whip and was hollering at the four dogs to chase the cows towards the pen opening. 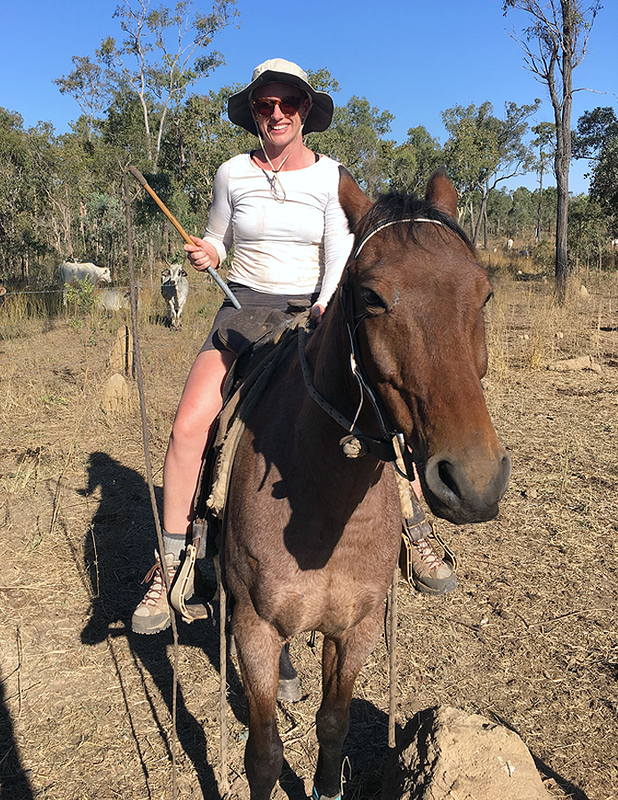 My horse Buster was more interested in walking slowly and eating long grass than chasing after cows, so I at least made sure to steer him towards the action as he ate along the way. While Ian did all the directing I took to the back to catch any stragglers who tried to backtrack. With no direction of what to do, I managed to do alright! When it came to moving the cows out of the pen and onto trucks, I remained on the outside of the gates and let the professionals handle it. I stuck to operating the exit door, sending the cows in the right direction. Cows don't like trucks so when the mothers had to use the ramp there was a lot of resistance, bucking, and chaos. Ian was knocked to the ground twice and the gates used for the exit path were tossed around as the cows rammed into the sides. There was one instance when I grabbed the gate closure just in the nick of time before a cow ripped through, most likely trampling me on the way out. The more stubborn ones took up to 10 minutes to get onto the truck once they had been pulled out of the pen. Most of them needed an electrical prod to the bum to get up the ramp and I wasn't emotionally prepared to do that, so I stayed on the outside of the pen, at a relatively safe distance away from the charging cows. We had to do four round-ups on horse in order to shift all the cows through the pen. In total, we pulled probably 45 mothers and shifted them to the other property. The sun had just set when we called it quits and started to pack up the horses and dogs. By the time we got home twelve hours had passed since we left that morning. I sat down to dinner that evening thinking, "My god I'll never last two weeks." Day one was definitely one for the books; there's nothing like a little fear and an increased heart rate to remind you you're alive. Ha! Weening only happens every 3-4 months, so my arrival was perfect timing to experience a mustering, but I was okay with sticking to daily maintenance tasks for the two weeks that followed.